Reading outside of school is a vital part of a child’s development. 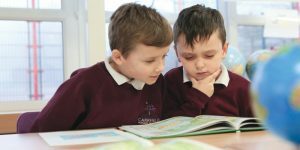 At Carrfield, we are committed to encouraging children to read as often as possible at home in order to improve their reading skills and increase their level of vocabulary as well. There is a significant amount of research that highlights why reading is important to children during their school years. Research Evidence on Reading for Pleasure Education Standards Research Team, DfE. Have you seen our display? Do you think you could guess which teacher is behind their favourite book? Your child should have a home reading book from school at all times – please speak to your child’s class teacher if this is not the case. This should be changed regularly by your child’s class teacher in Reception, Year 1 and Year 2. In years 3, 4, 5 and 6, your child will have an allocated ‘book band’ and will be able to choose their own reading book within that band – this is monitored by your child’s class teacher. Please record what your child has read with any details in their reading record; this can then be checked by their teacher. School also runs various incentives to encourage your child to read at home: we have recently completed our “Book Bucks” competition. If children read five times at home – recorded and signed in their reading record – they received a ‘buck’ to place in a prize draw. Here you can see two of our winners with their prizes – congratulations! Our previous competition was a massive success with lots of children reading eagerly at home to complete their Book Bingo sheets. 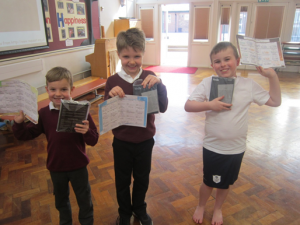 Well done to the winners who won a brand-new kindle each! We will be launching a new reading competition very soon. Please make sure you watch out for further information via letter, Twitter, Marvellous Me or here on the website. Which part of the reading was funniest? Which part was the most exciting? Which part was the saddest? Which is better … ? What is your opinion of … ? Were they right to do … ? Why? Or why not? Who would you choose … ? How would you … ? Do you know someone like … ? Would you do the same thing in the same situation? If you had to … what would you do? Always ask “Why?” – this will help your child explain their thinking. 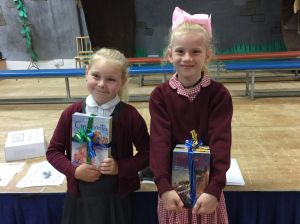 To encourage children reading a range of texts, we aim to have an author a term visit school to share their work. We already have authors arranged for 2017-18 to come and deliver exciting assemblies and activities. 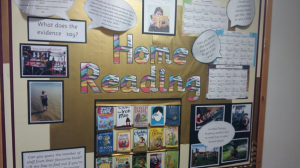 If you have any questions about your child’s reading book, or ways to support them reading at home, please speak to your child’s class teacher or Miss Wright.